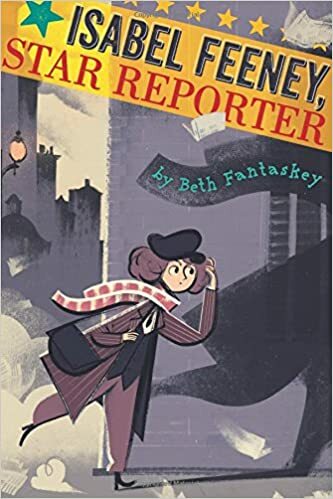 Summary: Isabel Feeney is a newsgirl in 1920s Chicago. One night, she sells a paper to one of her favorite customers, Miss Giddings, who then walks off with her boyfriend. A few minutes later, shots ring out in an alley. The boyfriend is dead, and Miss Giddings is arrested for murder. Isabel’s sure she’s innocent, and sets out to prove it. She gets the reluctant help of her hero, Maude Collier, a reporter for the Chicago Tribune who covers Murderess’s Row at the Cook County Jail. There are red herrings aplenty—mob connections, an angry ex-husband, a jealous sister—and Isabel finds herself in real danger. As a key witness, she’s called in to testify at Miss Giddings’s trial, and it’s there that she finally realizes (and dramatically reveals) the true murderer’s identity. 352 pages; grades 4-7. Pros: Historical fiction meets mystery in this tale of gangster-ridden Chicago. Isabel is a funny and feisty heroine, and the 97 short chapters, many with cliffhanger endings, keep the action going. Cons: I wasn’t exactly shocked to learn the identity of the murderer.